MONKEYS ARE MY FRIEND: The Winner Is AWESOME! Okay, lately there has been much drama (or, you know, long-winded babbling, whichever you prefer) about my search for the perfect interchangeable knitting needle. Well, I found it which you would think would end the uber-lengthy posts about it, but apparently not. Because, y'all, I got my HiyaHiya stainless SHARPS. When Dan and I were up in St. Louis this weekend, my in-laws gifted me with an early birthday present. Needles! OMG. I cannot stop gushing about how fantastic theses are to knit with. I'm sure everyone was getting tired of it at the end of just one day, but I just couldn't help it! Knitting with these puppies is almost magical. Words simply cannot express how delightful these are. As you can see in the picture above, I'm working on a stranded colorwork hat (alpaca hat!) on my new needles. But what that picture doesn't show is that I started the hat on a different brand of needles (because I didn't own the Hiyas at that point). But I had so many issues knitting with those needles - after just an hour of knitting, my fingers would throb and my hands were just so sore! So when I got my new needles, I promptly restarted the project, this time using just the HiyaHiyas. That's when the gushing began. To just give you an idea, I knit for almost eight hours straight (with an about 20 minute break for feeding in the middle) on our road trip yesterday. Then my hands started to get a little tired. So one hour of knitting with my old needles versus almost eight hours with my new. Yeah, I kind of love my HiyaHiyas. Just a bit. But on to the hat! Isn't that delightfully obnoxious? The colors don't mesh too much right now, but that's because the earflaps are the "light" colorwork sections and the bit right above it are the "dark". Next up is another "light" section that uses the colors from the earflaps so that should start tying things together a bit more. At least, that's the general theory. I hope it turns out that way! I also hope it fits me. The pattern is for a 20-21" head and I have a 23" head. So I upped the needle size, which is giving me the perfect gauge for the pattern to end up as 22.9" around. But the bottom is flaring quite a bit from the knitted cast on (I probably should have done that in the US3s before going up a size) but I figure I can get it snugged up at the end since the pattern calls for an attached i-cord around the edges. Also, it seems a lot of people end up with a huge hat so I am a little concerned (even though math says this will work perfectly) but if the i-cord doesn't snug it up enough, I can always felt the hat a little. I think a fuzzy alpaca would be divine. 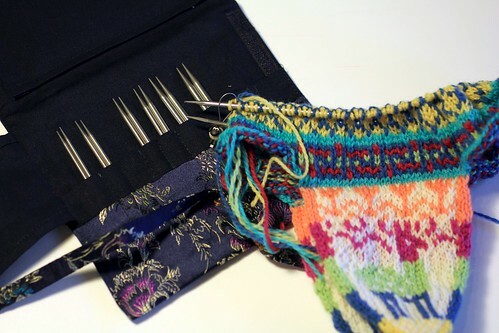 So there we have it: my newest knitting project and some gushing about the best needles ever! Whee! This entry is my gushing about the big winner! You know... I've been thinking of getting a back up set of interchangeable needles. Knit Picks are my first interchangeables, and I like them, but I will eventually purchase another set too. This week, I think I'll visit my LYS and give Hiya Hiya Sharps a test drive to see how I like them, if I do I'll purchase the set sometime this fall. A few of my friends like the wood and acrylic needles, I've tried those but didn't like them. It's great that knitters have a variety of options to choose! I've always love metal needles, and the fact that these are stainless steel has my attention. I love stainless steel. As many WIPS I can have going on, purchasing an additional set of interchangeables won't be wasted. ;) Eventually I'll purchase fixed circular needles. I've already have made up my mind to get the Signature set, but I won't be getting those until last next year. I think the HiyaHiyas are fantastic. I'll still probably get a back up set of other interchangeables but the more I use the HHs, the more I have trouble imagining enjoying knitting with anything else. (Though I do want to try the Chiaogoo interchangeables when they come out and the Knitter's Pride Karbonz.) Of course, they are for everyone, so I would be interested in hearing your thoughts on them once you have a chance to try them! After reading your opinion of interchangeable sets I had to get a set of the Hiya Hiya sharps. I got the 5". I love them. Thank you for leading me to them. They are so smooth, the joins are so good, the points are perfect and the cable seems to just melt away. I have a set of the Dyak metal and I am not in love with them. They have the typical grating feel and sound that you find with aluminum and to me they feel weightier than the Hiyas. I also have 2 sets of the DYak wood. They are my favorite wood needles. I've used Knitpicks, KnitPro, Addis, Addis Natural, Boye, and Denise. Dyak are, in my opinion, the best wood needle and Hiya Hiya sharps the best metal needle. If I could only have one set it would be the Hiya Hiya if for no other reason tha they go down to size 2. You can also get the small set and the large set for about what 1 set of Dyaks cost. Thanks for the information you shared about your Dyakcraft needles. Those were the one type I didn't get to try that I wanted to so it is nice to hear how they compare to other brands. A few moments ago, I finally ordered one of the Hiya Hiya's interchangeable needles (size 6.) I cannot wait for it to arrive, if I like HH, I'll definitely purchase both sets. I look forward to hearing what you think about them! I've LOVED using mine - I can't wait for the large Sharps set! My size 6 needles arrived Saturday, but a few hour after writing this post here, I ordered the 5" small sharp steel set. That's largely due to Jo Ellen, wonderful store owner at Yarn Bazaar. She was helpful, responded to my email quickly, and the needle set were 10% off. Saturday,I transferred my heart hat project to the circular needles that arrived... let's just say that I'm a convert! 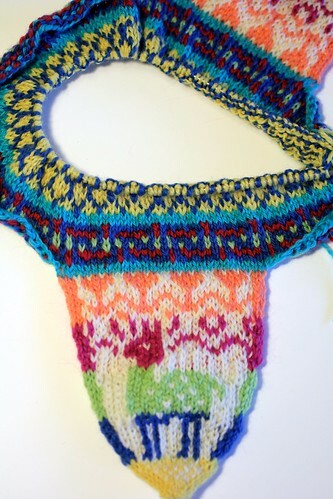 I never had my cables come undone with my Knit Picks, but that was because I'd twist the cables every few rows. In some instances, if I hadn't done that they would have come undone. I haven't had to do that once with my Hiya Hiyas and those size 6 needles have seen a lot of knitting since Saturday. I didn't knit with the needles that arrived yesterday, but I did admire my new 'precious' and was impressed with the lovely case too. Ever since I read your above review, I've been wanting to try Hiya Hiyas. Based on your other posts about other needles, it seems we like similar things when it comes to needles, and so I figured I'd be in love with them. :) Of course this now means, I'll have to purchase more cables, since I'm usually working on more than one WIP. Like yourself, I can't wait of the large Sharps set to be available. Yay! I'm so glad you like them! I really do think they are fantastic!